REGISTRATION IS OFFICIALLY CLOSED! CONGRATULATIONS TO ALL OF OUR CONTESTANTS AND STAY TUNED FOR FURTHER ANNOUNCEMENTS. WINNERS WILL BE ANNOUNCED IN MID TO LATE SUMMER. Animal Architecture seeks exciting projects that engage the lives, minds and behaviors of our alternate, sometimes familiar companion species — insects, birds, mammals, fish and microorganisms – each one with unique ways of world-making. As our society re-examines its place in the global ecology Animal Architecture invites your critical and unpublished essays and projects to address how architecture can mediate and encourage multiple new ways of species learning and benefiting from each other – or as we say it here: to illustrate cospecies coshaping. We believe that a greater understanding of biotic and ecological relationships can influence design, reshape our cities, and restructure our homes — benefiting the human and non-human animals that interact with and around them. The burgeoning field of Anthrozoology is quantifying the positive effects of actively engaging other animals in human life. More than just simply pets, how can this growing awareness of other species influence the way we shape the world? 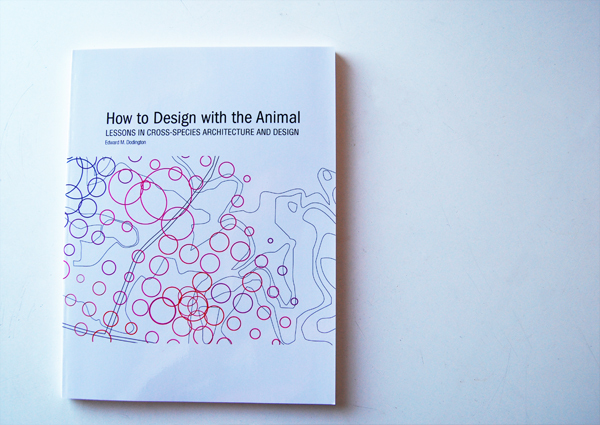 Animal Architecture wants to hear your ideas. Animal Architecture (formed in 2009) is dedicated to providing a forum for addressing the myriad issues arising from the complex interactions between animals and human society. The lens of our focus is Architecture. The aim of our study is to again see ourselves as partners in an intimate and reciprocal relationship with larger (sometime smaller) ecological forces. All creatures great and small. Submit your project to us. Submissions can include past work, current research and built or unbuilt projects. * Winning entries will be announced mid summer 2011 and will be eligible for inclusion in a publication and exhibition. Details to follow. 4) Further details regarding uploading, file transfer and submission will be disseminated after registration. 5) Posters available for distribution can be downloaded here (color and b/w). *Projects cannot have appeared in previous publications and the entrant(s) must have exclusive rights to all content. Neeraj Bhatia is a co-director of InfraNet Lab, partner of The Open Workshop and Visiting Wortham Fellow at Rice University. He received his Masters of Architecture + Urban Design from MIT where he was studying on a Fulbright Fellowship. He has worked for Eisenman Architects, Coop Himmelblau, Bruce Mau Design, OMA, ORG and Lateral Office. Neeraj previously taught at the University of Waterloo and the University of Toronto. He is co-editor of -Arium: Weather + Architecture (with Jürgen Mayer H., Hatje Cantz Publishing, 2009), Bracket [Soft Systems] (with Lola Sheppard, Actar, 2011) and co-author of Pamphlet Architecture 30: Coupling (Princeton Architectural Press, 2010). InfraNet Lab is a non-profit research collective probing the spatial byproducts of contemporary resource logistics and The Open Workshop is a design office examining the project of pluralism. Ned Dodington received an M.Arch from Rice University in 2009. While at Rice, Ned devoted his graduate career to studying ecological design strategies and management with an eye towards the built environment. His work has been published in Architectural Design Magazine, Brkt Magazine, Humanimaila, the Columbia University GSAP yearly student review, as well as Rice: Working 06-08, and All things Must Move. He has written for The Architectural Society in New York, Manifold Magazine, and the Houstonist. His built work has been shown in Minnesota and Houston. Ned was awarded the Technos international traveling fellowship in 2002 and the Mitchel Travel Fellowship in 2006, and a Rice Design Alliance Grant in 2010. In his off-hours Ned manages two small businesses devoted to fostering creative communities in Houston: Caroline Collective LLC, and C2 Creative. Allison Hunter is a visual artist who over the past twenty years has worked in photography, video, drawing, sculpture, and installation. Hunter earned her first MFA at the Cantonal Art School of Lausanne, Switzerland (1990, Drawing/Photography), and her second MFA at Rensselaer Polytechnic Institute in Troy, New York (1997, Video). Hunter participated in video and sculpture art residencies at institutions such as the Banff Centre for the Arts in Calgary, Canada and the Hermit Center for Metamedia in Plasy, Czech Republic. Hunter’s installation project, titled SIGNMAKERS (1998-2003),was commissioned by three European sculpture centers in Lithuania, Latvia, and Finland, and by the 2003 Kingston Sculpture Biennial in New York. Hunter’s photographs are collected by the Museum of Fine Arts, Houston, the University Art Museum at SUNY, the Albany Institute of History and Art, and the Center for Photography at Woodstock. Her work has been included in numerous exhibitions in the U.S. and Europe, including at the Kohler Center (Wisconsin), Project 304 (Bangkok), Künstlerhaus Mousonturm (Frankfurt) and in solo exhibitions at Women & Their Work (Austin), Artspace (North Carolina), and DiverseWorks (Houston), 2010. Hunter is the inaugural Artist-in-Residence at the University of Houston, co-sponsored by the Mitchell Center and the Texas Learning and Computation Center, Fall, 2010. During her residency, she will experiment with stereoscopic 3-D video for her latest installation project, Honey Bee. Hunter lives in Houston, Texas. Joyce received a post-professional Master of Architecture degree from Princeton University and a Bachelor of Architecture degree from Cornell University, where she was awarded the Charles Goodwin Sands Memorial Bronze Medal. Since 1997, she has practiced professionally with offices in San Francisco, New York, Philadelphia, and Barcelona, Spain. Hwang is a Registered Architect in New York State and an Assistant Professor of Architecture at University at Buffalo, SUNY. Sanford Kwinter is Professor of Architectural Theory and Criticsm at the Harvard Graduate School of Design. He is a writer and editor who earned his PhD. from Columbia University. He has taught at MIT and at Columbia and Rice universities, and was cofounder and editor of the journal Zone and Zone Books for 20 years. He has written widely on philosophical issues of design, architecture and urbanism and was an editorial member of the ANY conferences and publications as well as of Assemblage. He is the author of several articles and books including Architectures of Time: Towards a Theory of the Event in Modernist Culture (MIT Press, 2001), Far From Equilibrium: Essays on Technology and Design Culture (Actar, 2008) and Requiem: For the City at the Turn of the Millenium. He is currently at work on a book on Africa and the origin of form. Born and raised in New York, Jonathan received his Masters of Architecture degree from Rice University in 2007. He completed his undergraduate education at Cornell University in 2003, earning a Bachelor of Science in Design & Environmental Analysis. Jonathan has designed projects across a broad spectrum of market sectors, including higher education, cultural, corporate, institutional, and hospitality projects, at all stages of projects, from master planning, and visioning, all the way through construction documents, and administration. He was a 2006 Margaret Everson Fossi Fellowship and 2007 Rice Design Alliance Initiatives for Houston Grant recipient, and spent time traveling to Australian urban farms for research as part of those awards. Geoff Manaugh is the author of BLDGBLOG and The BLDGBLOG Book, former senior editor of Dwell magazine, and a contributing editor at Wired UK. In addition to leading research seminars and design studios at Columbia University, the University of Southern California, the Pratt Institute, and the University of Technology, Sydney, he lectures regularly at museums, schools, and other venues around the world, including the Chicago Humanities Festival, the Australian National Architecture Conference, the Architectural Association, the Bauhaus-Universität Weimar, UCLA, and others. Manaugh is also an active freelance journalist, writing for such publications as GOOD, Volume, The New York Times, Icon, and more. In 2009, The BLDGBLOG Book was selected by Amazon.com as one of the 100 Best Books of the Year. Manaugh lives in Los Angeles. Cary Wolfe’s books and edited collections include The Limits of American Literary Ideology in Pound and Emerson (Cambridge, 1993) Critical Environments: Postmodern Theory and the Pragmatics of the “Outside” (Minnesota, 1998), Animal Rites: American Culture, The Discourse of Species, and Posthumanist Theory (Chicago, 2003), the edited collection Zoontologies: The Question of the Animal (Minnesota, 2003), and, most recently, What Is Posthumanism? (Minnesota, 2009). He has also participated in two recent multi-authored collections: Philosophy and Animal Life (Columbia, 2008), with philosophers Cora Diamond, Ian Hacking, Stanley Cavell, and John McDowell, and The Death of the Animal : A Dialogue (Columbia, 2009), with philosophers Paola Cavalierii, Peter Singer, Harlan Miller, Matthew Calarco, and novelist J. M. Coetzee. The co-edited collection (with Branka Arsic) The Other Emerson: New Approaches, Divergent Paths, which includes essays by Donald Pease, Sharon Cameron, Eduardo Cadava, and others, will also appear in 2010 with the University of Minnesota Press, where he is founding editor of the series Posthumanities, which publishes four to six books per year. Recent and forthcoming authors in the series include Donna Haraway, Roberto Esposito, Isabelle Stengers, Michel Serres, and David Wills. He continues to research and publish widely in areas such as animal studies and posthumanism, systems theory and pragmatism, biopolitics and biophilosophy, and American literature and culture. He is currently working on two book-length projects: Before the Law: Animals in a Biopolitical Frame, on law, sovereignty, biopolitics, and species difference, and Wallace Stevens’ Birds, which uses this key topos in Stevens’ poetry to reread his body of work at the intersection of Romanticism, species difference, and posthumanism via theories of paradox, meaning, and observation drawn from second-order systems theory. What a great idea! I very much look forward to the submissions and results! ANIMAL ARCHITECTURE | Jak to jest by? nietoperzem? Too bad Temple Grandin didn’t make the jury. You’re right! Maybe we’ll be lucky enough to get her next year! The Animal Architecture Awards | DesignHomeOnline.net Designs Blog - Catalogue :: More than 16000 Photos, articles. New ideas for home design. Unfortunately I missed the deadline of registration, however it belongs to my PhD thesis very close. In case anybody wants to cooperate, or doesn’t have enough time to finish please write me to: zsoltfile@gmail.com.